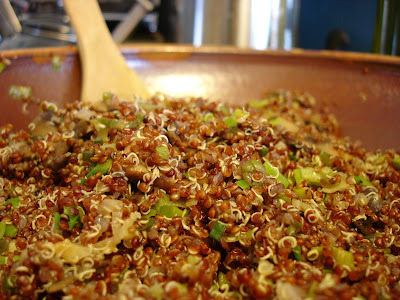 Today for lunch I made a quinoa salad with portabella mushrooms, leeks, scallions, and garlic. I started with this recipe from Luisa Weiss, who writes a weekly food blog called The Wednesday Chef, a very enjoyable blog. It turned out pretty good, but not fantastic. I think that the fresh parsley, cilantro, and lime zest would probably add a lot, and the leeks were a little strong for my taste, even after a vigorous sauteing. 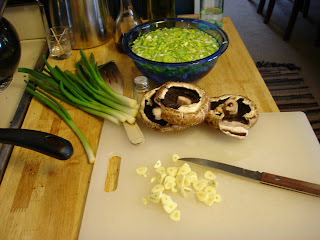 I think I'll probably make it again, probably still with portabellas, but trying to find fennel and making sure I remember the fresh herbs. I will say that I am still looking forward to having it as leftovers for the next couple of days - the recipe made way more than Craig and I needed. But hey, leftovers are good. It's also a very healthy meal. The quinoa is an excellent source of complete protein and dietary fiber, and the only fat is from the olive oil used to saute the ingredients that need sauteed. I love quinoa. It was the best discovery of my year in The Spain. Ok - maybe not the best, but very good.